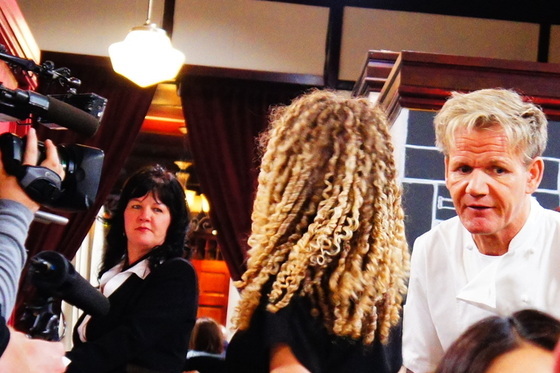 Fox TV's Kitchen Nightmares show descended on Everett's Prohibition Grille back in December; the show finally aired last night. In the kabuki of reality TV, the first half of the drama is to break the central character's pride. True to form, bad-boy Gordon Ramsay tears into Darlene "Rishi" Brown. Words an owner doesn't want to hear from the consultant who's job is to save her restaurant: "slop," "hideous," "dreadful," "disgusting," "an embarrassment." And that's after you've told him, on camera, that you think your food is a ten out of ten. Though the restaurant is named Prohibition Grille and calls itself a gourmet-Southern steakhouse, there's no actual grill in the kitchen. Pin the blame on the tough guy in the kitchen, Edward Trabue, a lazy dude with beard and ponytail who goes by "Chef Rocky" and takes it personally if a customer sends back a dish. He's on his cell, he's puffing away out back while the tickets stack up. "We text him with the orders," a waitress tells the cameras. But it's not all Rocky's fault. Rishi stays out of the kitchen but imposes her penchant for belly dancing on the dining room every night. "Rishi is naive," says one of her employees. "Clueless," says another. "It frustrates us all that Rishi thinks everything's okay." Rishi doesn't miss an opportunity to play dumb. "I thought soup-of-the-day just meant whatever soup you're serving." And "I thought fresh meant 'not frozen.'" Confused, "mortified," she finally admits to Chef Ramsay, that she's losing a couple of grand a week but is afraid to confront Rocky. "I'm just so scared," she confesses, breaking into tears. It's the moment that the producers have been waiting for. Ramsay swivels from his dickish persona to his soft side, promising Rishi that he'll do everything he can to support her, but she has to promise she'll fire Rocky. Once that's done (painlessly it turns out), the makeover begins. Seattle chef Tyler Palagi is brought in for a couple of weeks to run the kitchen; Rishi gets a new haircut and a pants suit and promises to leave belly dancing behind. Ramsay shows the staff that they shouldn't be intimidated by the kitchen and introduces a much-simplified "gastropub" menu. Overnight, a crew of contractors comes in to repaint the bar (bright lacquered red) and add decorative touches to the walls. The chef that Tyler brought in didn't work out, so Rishi found her own "consulting chef," a woman named Marketta Schreck who runs the kitchen at a private club (The Ruins) and mentors Rish's two line cooks, Jeff and Dennis. "Marketta is amazing and is helping me with menu development and quality control in our kitchen. I love working with another woman." We need to keep in mind that restaurant makeover shows really have almost nothing to do with cooking, or even with hospitality management. They're about makeovers for people. Rishi herself has stayed in touch by email. She promised Ramsay she wouldn't do any belly dancing in the restaurant but she has booked a full slate of bands five nights a week. "I keep reminding myself if I succeeded through all of that [the first four years] I can definitely survive this positive opportunity for change and growth." This page contains a single entry by Cornichon published on April 27, 2013 11:30 AM. Rishi's Kitchen Nightmare: What's Cooking? was the previous entry in this blog. Spurred on to a better bite is the next entry in this blog.